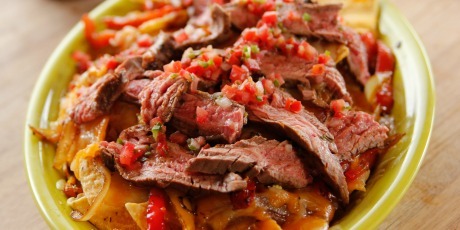 Sizzling fajita fixings are used as a topper for nachos and finished with grated cheese. 1. Combine the olive oil, garlic, lime juice, chipotle peppers with sauce and cilantro in the bowl of a food processor or a blender. Blend until totally combined. Put the flank steak in a large resealable plastic bag or baking dish. Pour in the marinade and make sure it adequately coats the meat. Seal the bag or cover tightly and refrigerate for 24 hours at least. 1. When ready to make the nachos, preheat the oven to 350ºF. Heat an indoor grill pan to high. Remove the meat from the marinade (discard the marinade). 2. Drizzle a little olive oil on the grill and grill the meat over very high heat, about 4 minutes per side. (Turn it 45 degrees halfway through on both sides to get nifty grill marks.) Set aside to rest. 3. In a large skillet, heat a couple of tablespoons of olive oil over medium-high heat. Add the onions and peppers, sprinkle over the taco seasoning and cook until the vegetables are somewhat soft and starting to get black bits, 3 to 5 minutes. Set aside. 4. Slice half of the flank steak into strips against the grain, then chop the slices into smaller bites (see Cook's Note). Put the sauteed veggies on a cutting board and roughly chop to get them into smaller pieces. 5. Arrange the tortilla chips on a large ovenproof platter (or baking sheet). Sprinkle plenty of cheese all over the top. Put the platter in the oven for 3 minutes or so, just long enough to melt the cheese (but not burn the chips). Generously sprinkle the peppers, onions and chopped steak all over the top. Garnish with cilantro leaves. 1. Serve immediately with salsa, sour cream and pico de gallo. Use the other half of the flank steak to make another batch of nachos, or just save it in the fridge and snack on it over the next few days.